Posted under Puerto Rico, Trips & Tours by MicheleP. I’ve been sorely neglecting the blog of late. I have lots of stories to tell but sometimes just thinking about how to tell them makes me tired! I kind of like the one-line Facebook entries better – much less effort involved . But looking back, I love having a record of our life adventures so I need to get back on the blog wagon. We enjoyed some quiet walks on the beach, hanging out at the adult pool, lunch and drinks poolside and even lost some money in the casino. And what about the girls, you ask? 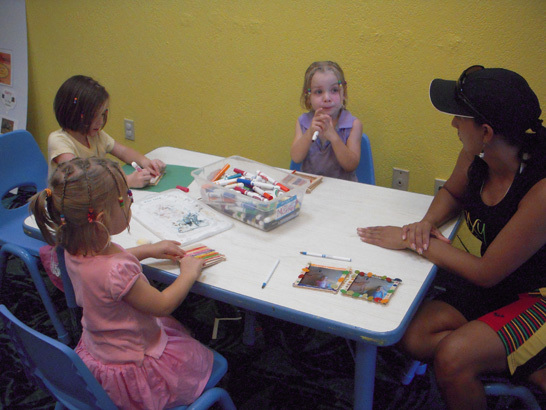 The girls had a blast in the resort’s Iguanna Kid’s Club and got to play tennis, get their hair braided, feed some very large iguanas and do “arks” & crafts. A few weeks ago we took off to explore a new part of the island (well, new to us – I’m sure it’s not actually “new”). We went through Ponce and stopped for lunch – at Chili’s. I know, it’s not that unique…but it’s reliable, offers food that isn’t fried and has clean bathrooms – three things that make me a happy camper. After lunch we headed West to the town of Guanica on the Southern coast of the island. We had heard about this “dry forest” there but really had no idea what to expect. Unlike visiting El Yunque, one had ever mentioned to us “Oh – you just HAVE to go to the dry forest” so we didn’t have very high expectations. On the way to one of the entrances, we came upon a resort that looked pretty cool. We stopped to get some information. 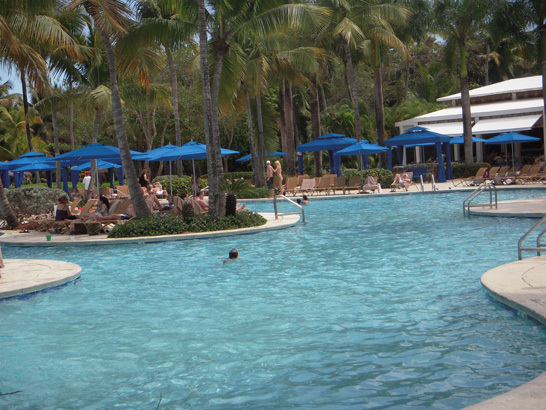 Turns out, it’s the only all-inclusive resort on the island and seemed very much our style – nice but casual and low key. We made a mental note to put Copamarina on our PR Bucket List. 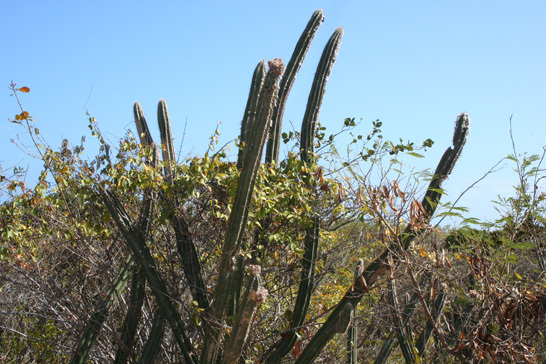 Continuing on down the road, we were treated to some amazing views of the Caribbean on one side and then this rough, scraggly, dry and arid land on the other – it really is amazing to see such diversity on one island. There is also a small island just off the coast – Gilligan’s Island – that you can take a ferry or boat charter to. There are no facilities on the island but it looked like a great place to spend the day. We hiked along the coast for a while and then came back to the beach to play there. 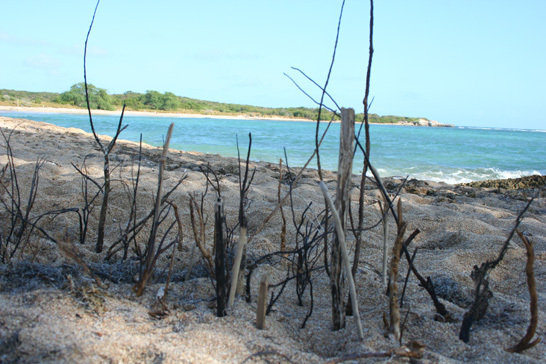 The current was pretty strong here so we stayed out of the water – and made our own “dry forest” in the sand. Posted under Life, Puerto Rico, Trips & Tours by MicheleP. Our second weekend of beach bumming took us and some friends to Luquillo Beach. We left early as we were afraid it would be crowded since it was a holiday weekendÂ arriving at the beach by about 10 in the morning. Clearly we were plenty early as there was only one other car in the parking lot . By 4:00 we saw another band of clouds moving in so we decided to call it a day and head home. 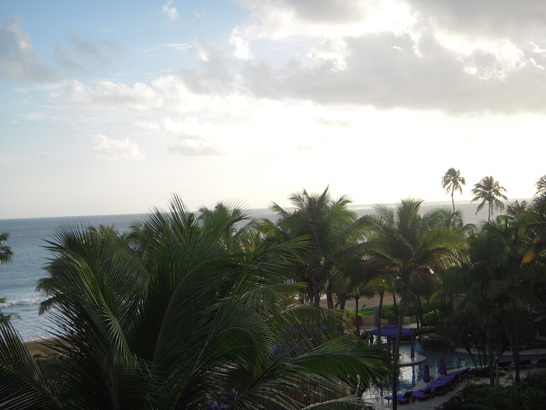 We loved Luquillo beach and will be back! After neglecting our beaches since June (isn’t that crazy?!) we spent the past two weekends at the beach. Last weekend we had fun at Cerro Gordo beach. It was a rainy day and so even though it was a Saturday, we pretty much had the place to ourselves. While we had a great day at the beach – there was one drawback. 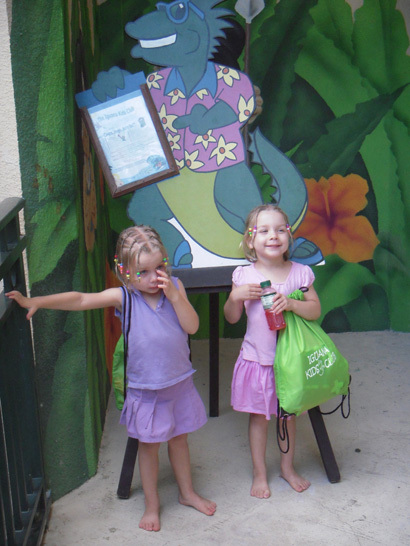 I waited until we were AT the beach to put sunscreen on the girls. Well, when we got there, it was raining and so we were all wet – and then all sandy and wet. Have you ever tried to apply sunscreen to sandy, wet skin – especially aÂ 3 year old who is full of wiggles? Poor Clara got burned and wasn’t happy about it. Sorry about that sweet girl! 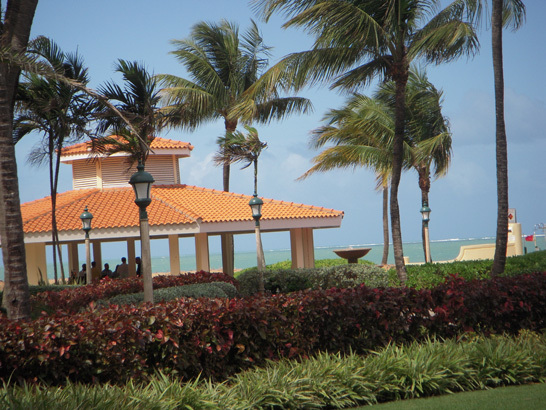 Posted under All in the family, Puerto Rico, Trips & Tours by MicheleP. 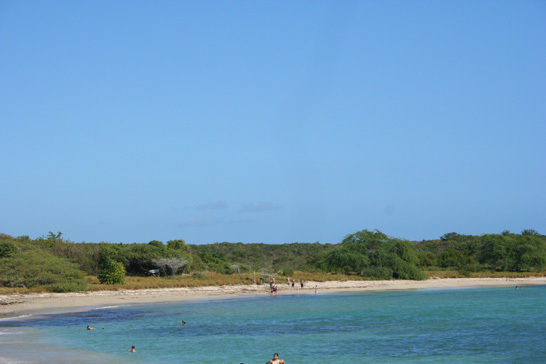 It seems that in my attempt to perfect the trip to Culebra – the FORTH attempt is a charm. We decided not to take any chances and we purchased plane tickets for the quick 10 minute flight over. This is absolutely the BEST way to go to Culebra. Of course you pay for that convenience – but on busy summer days, I’m convinced it’s the only way to make sure you can actually get there…and get back. Our flight was scheduled to leave Culebra at 9:30. We arrived at the airport around 8:45 and by 9:00 we were in the boarding area ready to go. I had warned Heather about the type of flight this was and she didn’t seem concerned. Until she actually saw the plane – she said something about her dog being larger than the plane – and it didn’t help that etched on the nose of the plane was “In Memory Of…”. Not exactly the reassurance we needed. We got our seat “assignments” (which amounts to a balancing of the plane based on each passenger’s weight) and we were off. I have honestly never seen a more beautiful beach. It is like being in a big swimming pool – the water is so crystal clear and the sand is soft and fine. The ONLY negative is that everyone else knows it’s the best beach in PR and so it’s quite popular – especially on weekends. It was a glorious day – I spent a good part of it brainstorming how I could make a living there. There is nothing like laying on a beach with the sounds of crashing wavesÂ – even ifÂ I got a little too much sun. All good things – do they really have to end? Yesterday we said goodbye to Heather. There were some tears. I had so much fun having my friend here. It’s been way too long since I’ve been able to hang out with a friend like Heather. Scott summed Heather up well when he said, “Heather is a perfect friend because she brings out the real you.” I don’t have to pretend ANYTHING with her. I can just be who I am and she loves me…maybe even LIKES me for it…and that’s, well, it’sÂ just priceless. I had planned on doing daily blogs of all of our adventures…but then the internet wasn’t behaving and then, well, I really didn’t think I should share details of our complete laziness day by day (we did eventually get out of pajamas each day – although some days we only made it as far as swimsuits). So, I’ll just give you a few of the highlights in pictures. We spent one day in Old San Juan and the Fort…in Heather’s words, “It’s really old.” She’s quite profound like that. We finally wised up and rode the free trolleys through town. Why it took us 6 months to figure this out, I don’t know – but it’s the best way to see the city and save your feet in the process. We also ate. A lot. And even though we enjoyed our day on the island of Culebra ViequesÂ - we made plans to try again – but this time we were determined to actually make it to Culebra . So what do you think…were we successful or not?